The Rose Throne felt like historical fiction, even though it wasn’t. Harrison built the world so well that I could picture it like I picture real places. I was drawn into the novel and felt for both girls having to live a life that wasn’t quite theirs and wanting to do something they actually wanted to instead of what was expected of them. Ailsbet isn’t considered to be anything more than a pawn, to do with as the king pleases in order to meet the goals he wishes. She doesn’t possess the female magic, she isn’t the most beautiful woman in the land, and she isn’t the most personable. Her music is what makes her who she is, but her kingdom doesn’t appreciate that talent. The kingdom she lives in appreciates raw power, the strength of men. She’s trapped in a place that doesn’t appreciate her but will use her any which way she can be used. Marissa grew up in a kingdom that celebrated the female powers. She’s lived a different life than Ailsbet and has ended up a bit more sheltered. She knows what a princess must do, but until it is right in front of her, she didn’t accept it as her fate. Where Ailsbet just wants to play her music, Marissa wants to follow her heart and find a love that means more to her than any title. The lives of these two princesses depend on each other and each choice one makes affects the other. There is only room for one of them on the throne, but many ways for one of them to get there. They are both faced with tough decisions and both face an uncertain future. The turmoil in this novel is written superbly and made it tough to put the book down. The main thing that drew me out of the novel was the passiveness that seemed to flow from the pages. There were many moments where the tension would have been wound even greater, but the style of writing made those moments fall a little flat. I’m sure there are some that adore this style of writing, but I felt it didn’t fit the novel. 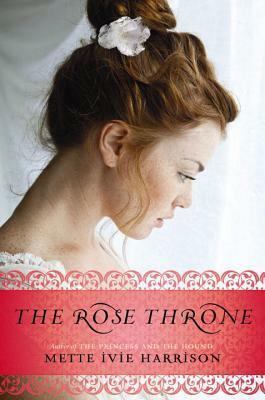 The Rose Throne is like reading historical fiction with a twist. The magical elements made the story stand out and kept me turning the pages. I’m interested to see if there is more o this story and how it all plays out. Thank you to EgmontUSA and NetGalley for an advanced copy of the novel in exchange for an honest review. This entry was posted in Something a Little Different, Young (and New) Adult and tagged Fantasy, Mette Ivie Harrison.